True love is not satisfied with "I’m ok, you’re ok," but challenges us to virtue, to pursuit of the good, and to friendship with Jesus Christ. As I crossed the Tiber early last Sunday morning, the crowds were so thick and pushing that it took more than an hour to move the last 50 yards to turn the corner onto Via Conciliazione and a view of St. Peter’s Basilica. There were pilgrims from all parts of the world: Spaniards, Australians, a remarkable number of French (including a couple whose five young children wore matching jackets), a large group from Equatorial Guinea were also matching with commemorative traditional garb marked with images of Pope John Paul. I saw Slovaks, Americans, Nigerians, Lebanese, Italians, and legions of Poles young and old, waving red and white flags and holding banners. More than one million Poles came to Rome to see their native son raised to the altars. A risk-taking American couple had brought along three of their children, including a five-month-old in a baby carriage. At moments it was unnerving to stand in such a crush of people, yet despite the multitude, nearly everyone kept their calm and minded their manners. It was no European football match. 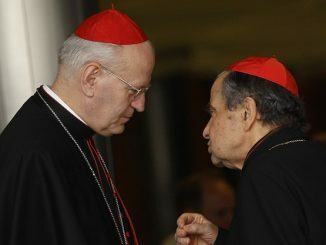 The love that John Paul II evokes has long perplexed journalists. George Weigel tells the story of a reporter who was stunned to see 90,000 people in Denver’s Mile High Stadium chanting “JP II, we love you!” She attempted to explain away the faithful as “Vatican plants.” There is an attractiveness about sanctity that doesn’t fit into our normal categories. Perhaps this is why it is easier for the media not to deal with it. We recognized this love in him and we responded. Few things better demonstrate this than the phenomenon that is World Youth Day. No one predicted the incredible crowds of young people who would travel and camp out to see the Pope. In Denver in 1993 the American bishops were skeptical that the young people would even show up. As Weigel notes in Witness to Hope, some quietly considered John Paul II a liability to the Church. But show up they did, by the busload. World Youth Day drew the largest crowd in Colorado history—more a half-million people. Two years later, five million people showed up to see the Pope in the Philippines, in what some have estimated is the largest human gathering in the history of the world. John Paul’s style of relating to people, and especially the young, was unique for a cleric of his era. From his days as a young pastor and bishop, he went kayaking, skiing, and hiking with lay people, engaging them one on one, learning about their struggles, frustration, desires, hopes, and fears. As Pope he took this same style of engagement to the world. Philosopher Max Scheler, the subject of Karol Wojtyla’s dissertation, insisted that contrary to the popular sentiment, love is not blind, in fact, it sees so clearly that it is creative. It sees the potential in a person and draws it out. It does not ignore faults or sins, or try to explain them away, but it doesn’t stop with them. Because love seeks the good of the other, it sees possibility. Love is not satisfied with “I’m ok, you’re ok,” but challenges us to virtue, to honesty with ourselves, to pursuit of the good, the true, and the beautiful—and to friendship with Jesus Christ. His words echoed in the quietness of our hearts: “Do not be afraid, do not be satisfied with mediocrity, cast out your nets into the deep for a catch.” We sense that what this world offers is not enough. Pope John Paul gave us the language and the vision to understand why. John Paul taught us the meaning of suffering and its redemptive value—and then he lived it, suffering as the world watched. He found the Cross no easier than any of us does. He taught us that joy was not something to be grasped, but a gift to be received, the fruit of love and service. And of course John Paul taught us about Jesus Christ, the source of every joy. Perhaps most important, amidst the “dictatorship of relativism” John Paul told us the truth, even when we were unwilling to hear it. People called him an ideologue and an authoritarian. What he was however, was a true philosopher, a lover of wisdom who knew that only a deep commitment to the “splendor of truth” can withstand ideology and provide a path to answer the fundamental questions that “no one can escape…What must I do? How do I distinguish good from evil?” This resonated especially with young people who crave the truth, yet too often are presented only with flattery, disdain, or with ideological indoctrination that serves some interest. Ultimately, John Paul II taught us, young and old, healthy and sick, what it means to be a person with an eternal destiny called to friendship with Christ. He was a father to us. He loved us and we love him back. 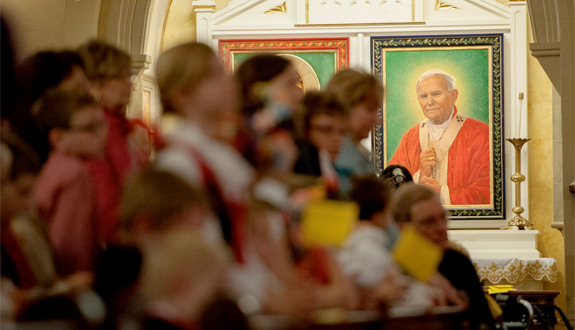 Once in response to the crowd’s chant of “JPII, we love you,” he replied, “JP II, he loves you.” But we already knew this.